New Delhi, February 8, 2019: The President of the National Rifle Association of India (NRAI), Mr. Raninder Singh, who is now also the Vice President of the International Shooting Sport Federation (ISSF), expressed confidence in the Indian team’s prospects in the upcoming International Shooting Sport Federation (ISSF) World Cup Rifle/Pistol, New Delhi, 2019, at a Press Conference organized to make members of the Indian squadinteract with the media. The top international sporting event, scheduled on February 20-28 at the Dr. Karni Singh Shooting Range (KSSR) in the National Capital, assumes even more significance, given 16 Tokyo 2020 Olympics quotas are up for grabs in eight of the 10 scheduled medal events. 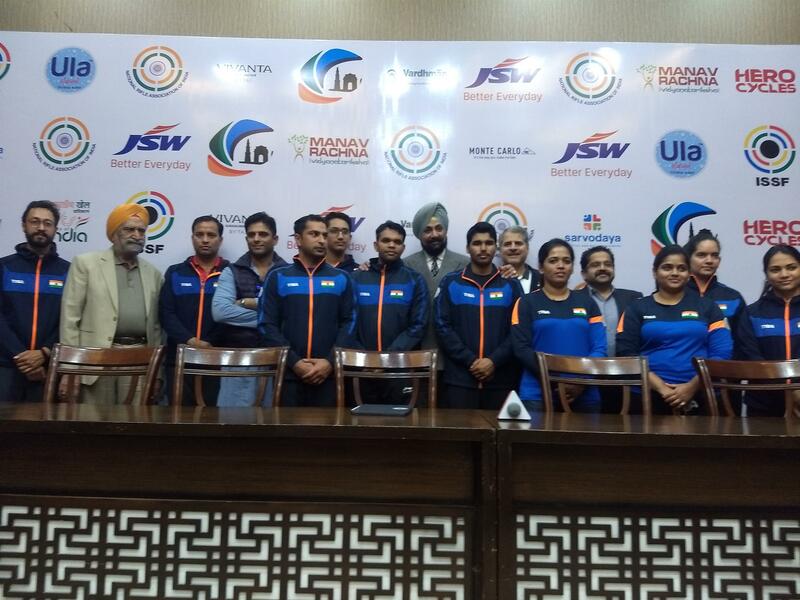 Among the 10 out of 23 competing Indian team members present were ApurviChandela (Women’s 10m Air Rifle & Mixed Team), Ravi Kumar (Men’s 10m Air Rifle & Mixed Team), Sanjeev Rajput (Men’s 50m Rifle 3 Positions), RahiSarnobat (Women’s 25m Pistol), AbhishekVerma (Men’s 10m Air Pistol), Saurabh Chaudhary (Men’s 10m Air Pistol & Mixed Team), TejaswiniSawant (Women’s 50m Rifle 3 Positions), AnjumMoudgil (Women’s 10m Air Rifle), Deepak Kumar (Men’s 10m Air Rifle) and Adarsh Singh (Men’s 25m Rapid Fire Pistol). Hosts India will be fielding a 34-member squad, including 11 in the non-competition Minimum Qualification Score (MQS) category. In all, 495 athletes from 58 nations will be converging in Delhi when competitions begin in right earnest with the first final slated for February 23, 2019. A slew of top athletes of the sport including legends, reigning and former Olympic Champions, World Champions, Asian Games Champions, Commonwealth Games Champions and World Cup winners will enthrall fans over five days of top quality Olympic sporting action. Only the two Mixed Team events, one each in Air Rifle and Air Pistol,out of the 10 events will have no quotas on offer. India have already bagged their maximum share of two country quotas in the Women’s 10m Air Rifle competition through AnjumMoudgil and ApurviChandela in the ISSF World Championship in Changwon last year. As such, these athletes will not be eligible for quotas, however that does not stop them from winning a coveted World Cup medal. India, therefore, will look to bag the maximum possible from the 14 quotas in seven events that they are eligible to win quotas in.